“Napoleon Bonaparte used to sleep on his horse. Generals must be visible at all time,” says Dr KH Gharda - Chairman and Managing Director of Gharda Chemicals Ltd (GCL), in a tête-à-tête with PROCESS India. This 81-year-old stalwart — who believes in silently fulfilling his role of a front liner, maintains a low profile and lets his work speak for him — has made far-reaching contributions to the Indian chemical industry. PROCESS:Considering your significant contributions to the Indian chemical industry over the past four decades, kindly help us trace the developments made by the industry. KH Gharda:Now everything has a chemical connection. The Indian chemical industry has made huge strides over the last four decades. The size of processing plants has increased by 10 times. In fact, India now boasts of having the largest polypropylene plant in the world and a world-class petroleum refinery plant at Jamnagar. Today, the chemical industry endeavours to discourage technology import. The majority of chemical companies have started according highest priority to R&D activities, which has helped the industry to maintain its competitive edge and earn global reputation. PROCESS:GCL has won several awards for technical innovation in the fields of dyestuffs, pesticides, veterinary drugs and polymers. Please outline the measures undertaken by the company to achieve this distinction. KH Gharda:At GCL, we firmly believe in developing our own technology — both engineering and process development. Right from the stage of ideation, building reactors and pipelines and conducting laboratory tests to dynamic development of products, we always encourage in-house initiatives. For this, we continuously invest in R&D initiatives as well as our physical workforce. In fact, we constantly invest three to five percent of our sales on R&D. On back of our in-house research, we have developed a process for making poly ether ketones and poly benzimidazoles on a semi-commercial scale. These products were exhibited at K-10 in Dusseldorf where these were received very well. We have also made fabrics out of meta-aramid fibre, which can be used by civilian fire brigades or by armed forces while tackling hazardous situations. These products will be manufactured on a commercial scale from 2012, and in the interim period, we will maintain supplies from our pilot plants. Besides the domestic market, our products enjoy demand from key Western markets such as the US and Europe, mainly from sectors such as aerospace, oil and gas well drilling and nuclear power machinery, among others. PROCESS:GCL is a pioneering company in the agrochemical sector in India. Please tell us how GCL has emerged as a major exporter of agrochemicals? our products are quite a hit among foreign players in most Western countries, who are also much more reliable in terms of making payments. This helps us to earn better profit margins. I am quite thrilled about our company’s success. Earlier countries like Germany used to dominate this segment but now we are at par, which is a great feeling. PROCESS:With foreign players setting base in India, do you think that the domestic chemical industry is facing a potential threat? KH Gharda:Well, I really do not think that the domestic players should have any reason to feel threatened with their foreign counterparts setting up base in India. The level of competence among domestic players, especially manufacturers of fine chemicals, has increased by leaps and bounds. We now belong to the top-rung of the ladder due to our good performance. R&D initiatives are also being undertaken, which is the key to maintain a competitive edge amid competition from foreign players. I also think that government intervention is essential to a certain extent. Moreover, the mindset of the industry stakeholders has to change. They have to stop thinking from the point of view of traders and start thinking from the perspective of manufacturers of sophisticated products. In fact, it is heartening to see that large number of professionals is steadily entering the industry. 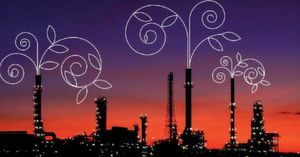 PROCESS:How is the Indian chemical industry addressing environmental issues? What efforts have been undertaken so far to ensure adherence to environmental safeguards and other related compliance matters? KH Gharda:The domestic chemical industry is definitely adhering to environmental safeguards. The effluent management system is improving steadily among industry players. For instance, I can confidently say that we, at GCL, endeavour to ensure more than 90 percent compliance to environmental laws, which is highly appreciated by our clients. But I must say in the same vein that the environmental laws in India are extremely strict, so much so that they are poorly absorbed, which often leads to bureaucratic hassles arising out of non-compliance. Moreover, separate laws are practiced by big and small companies while managing effluents. Here I would like to draw attention to the two levels followed by effluent treatment plants at the factory and estate level. It is seen that effluents are managed well at the factory level. But the problem arises at the estate level where mainly smaller companies tend to dispose effluents irresponsibly, the onus of which often falls on the bigger companies. This is quite irksome and needs to change through effective policy implementation. PROCESS:How does it feel to be a recipient of the prestigious ICC Lifetime Achievement Award For The Entrepreneur? KH Gharda:Of course, winning a prestigious award like the ICC Lifetime Achievement Award For The Entrepreneur is an honour; but at this age, the fact that my knowledge could touch many lives matters more to me than anything else. PROCESS:Do you undertake CSR initiatives at GCL? KH Gharda:Yes, GCL does undertake CSR initiatives. We run the Gharda Scientific Research Foundation (GSRF), a not-for-profit company, which is part of the Aban & Keki Gharda Memorial Trust. The primary aim of GSRF is to serve the society — both in India and abroad — with high-tech products. We plough back profit from our sales into the R&D wing of the company. Therefore, our pricing policy is not completely commercial but is cost-based, depending on the life cycle of the product to further expand the user base. GSRF also runs an engineering college called the Gharda Institute of Technology (GIT), affiliated with the University of Bombay, where six disciplines are taught. GIT will graduate its first batch in all six disciplines by mid-2011. Besides, we are also engaged in various social welfare activities. For example, we provide micro credit and help the rural population especially women. We also provide grants and scholarships to students from time-to-time, among others. Personally, I have donated almost 95 percent of my wealth to the Aban & Keki Gharda Memorial Trust. PROCESS:Please share with us your views about the future of the domestic chemical industry. KH Gharda:I am very optimistic about the future prospects of the Indian chemical industry. The industry is set to witness a golden era in the near future. However, the domestic political situation has to stabilise for proper policy implementation. Also, the mindset of the stakeholders in the industry has to improve to ensure and sustain longterm growth. We are on the cusp of an important juncture and, if we do not put in concerted efforts, we will only have ourselves to blame. * The author is a member of the PROCESS India Editorial Team.